Relieves pain (chronic, muscular, joint …). High concentration (25mg of CBD per capsule) and broad-spectrum (other phytocannabinoids). Contains no psychotropic substances (THC). 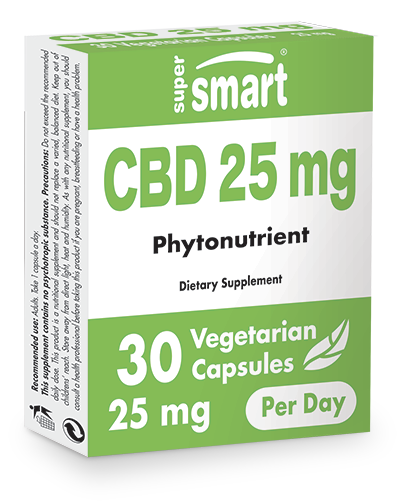 A powerful and original nutrient, CBD 25mg is emerging as an important natural painkiller: it is aimed at anyone who is exhausted by pain and the impact it has on their everyday life. It is similar to CBD Oil 6% but has a much higher concentration of active principles (25mg vs 5mg for CBD Oil). sleep problems caused by pain of various sorts. Cannabidiol (CBD) is a phytocannabinoid molecule found in hemp ((Cannabis sativa) alongside the well-known psychotropic substance tetrahydrocannabinol (THC). However, unlike THC, CBD does not have any narcotic properties. It is a natural compound which mimics the action of endocannabinoid messengers produced by the body. Like them, it is able to bind to specific receptors (CB1 and CB2) located on external cell membranes, and trigger various cellular responses such as restricting synaptic transmission, relieving pain and reducing spontaneous locomotion (1). Just like endogenous cannabinoids, CBD thus inhibits the transmission of small diameter nociceptive fibres (which are involved in the pain process) and reduces the release of neurotransmitters like substance P, responsible for transmitting pain . Unlike THC, which has a strong affinity for CB1 receptors, CBD binds more to CB2 receptors. These are found on the surface of cells of the central nervous system and in particular in immune system tissues where they are involved in modulating memory, emotions and pain (chronic, inflammatory or neuropathic) (2-3). What are the effects of CBD 25mg on pain? A reduction in the inflammatory response . The modulation of receptors leads to both a rise in BDNF (a protein that promotes growth and differentiation of new nerve cells), and a reduction in microglial cells and pro-inflammatory mediators (4-5). A decrease in sensitivity to pain. CBD promotes activation of PPARs, proteins that act as a transcription factor for certain genes involved in pain transmission. A neuro-protective effect . CBD helps increase levels of adenosine in the brain which is associated with neuroprotection and decreased inflammation. (8). An analgesic effect (by reducing the transmission of nociceptive fibres). An anxiolytic effect. . Human imaging has shown that CBD affects areas of the brain involved in the neurobiology of several disorders such as stress and anxiety. An improvement in sleep (9). What’s the right CBD dose for optimal efficacy? the severity of the initial problem or symptoms. For someone with a bodyweight of 70kg, and where the product is standardised to 17% CBD, the optimal dose would be 25mg, although this can be gradually increased to 50mg depending on the results obtained (though this higher dose should not be exceeded). CBD can also be vaporised but the most stable and consistent mode of administration is expertly-dosed, oral capsules. “Over a lifetime, our body’s physiology changes, as does the number and distribution of receptors in the endocannabinoid system which are directly responsible for interactions with CBD. The optimal dose will therefore change depending on the individual and age“Nick Jikomes, PhD, neuro-physician. How is CBD 25mg produced? CBD 25mg is obtained by plant extraction using supercritical carbon dioxide (sCO₂). This is an alternative mode of extraction to the organochlorine solvents normally used in such processes but which are potentially harmful to the environment. Very eco-friendly, sCO₂ both ensures the final product is free from solvent residues and helps maintain the chemical integrity of the heat-sensitive molecules. It is odourless, colourless, non-toxic and non-inflammable and is completely safe for our health and our environment. Does CBD 25mg produce any side-effects? Unlike the drug cannabis which usually contains around 15% THC, the form used in this product has none. It therefore has no psychotropic effects and has an excellent safety profile in humans. Once ingested, CBD is rapidly distributed around the body. It is lipophilic and thus quickly crosses the blood-brain barrier to reach brain tissues. It has no effect on heart rate, blood pressure or body temperature. CBD’s half-life is around 9 hours after which it is excreted in a metabolised form in urine. To date, no public health problem has been associated with the nutritional use of CBD. Schultes RE. Hallucinogens of Plant Origin.Science. 1969;163:245–54. Castillo A, Tolóna MR, Fernández-Ruizb, J, Romeroa J, Martinez-Orgadoa J. The neuroprotective effect of cannabidiol in an in vitro model of newborn hypoxic–ischemic brain damage in mice is mediated by CB2 and adenosine receptors. Neurobiol Dis. 2010;37:434–40. Other ingredients:  Acacia gum, rice flour. Be careful: We do not deliver CBD 25 mg in this/those state(s) and countrie(s) : IDAHO (ID), KANSAS (KS), NEBRASKA (NE), SOUTH DAKOTA (SD).